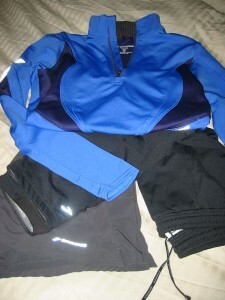 Some of my favorite running gear--Brooks shorts, capri tights, and Equilibrium shirt. You can pick almost any category of life and chances are anyone you ask will have their favorite something in that category. Favorite food, color, car, holiday, the list goes on. As a runner and an athlete I have favorite gear and I’m sure you do too. However, I don’t think you just stumble upon the best gear for your needs, I think you acquire it through a series of trial and error with all different kinds of gear. I’ve written before about things that I have had the chance to try out like sports bras and shorts and I have written about the importance of layers that I discovered during winter running. Any time I have the chance to share an experience that helps or improves my running or that simply makes me happy (and I’m easily pleased!) I will be doing so on this site. And if I come across things that don’t fit so well with my work-outs or training I’ll share that too. What works for me may not work for you but at least if you’re researching you’ll have one more source to confer. I will provide links and resources to the things I love and when you see that link it is because I have used the product or like the brand (and in some cases have a relationship with them) and if you choose to check it out, that’s awesome. For some reason I only own a few pairs of running shorts and one of them is a pair of what are now called Infiniti shorts by Brooks though they might have been called something else when I bought them. Mine are gray and I love how lightweight they are. The elastic isn’t too tight on my waist and yet it also hasn’t disintegrated over the years. There are two deeper pockets in the back that can hold Gu and there is a front pocket sewn into the inside where I stash my key and chapstick. A stability ball is an essential accessory and resistance bands can come in handy for lots of work-outs. In college, one of the first experiences I had with Pilates was with Gaiam DVDs and a floor mat in my room. The gym I belonged to at the time charged extra for Pilates so the DVD collection slowly grew so that I could do that work-out at home. After college, I didn’t have a gym membership for a long time and would try to recreate work-outs from SELF magazine at home. They often involved accessories that I didn’t have like a stability ball or resistance bands. 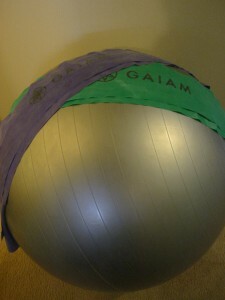 Off I’d go to purchase the needed items and I always turned to Gaiam because it is a brand that I know. Only recently did I go to their website where I learned they have a whole range of products from clothing to home items to fitness accessories and their mission is to make eco-friendly products. They also support fair trade which I appreciate. I find everything about their products and website to be calming and balancing which I suppose is right in line with why their products center around a wholesome and healthy lifestyle. 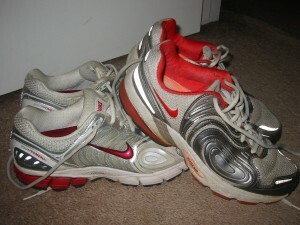 My trusty last two pairs of Nike Zoom shoes; will the next pair also be Nike? My last two pairs of running shoes have been Nikes and they have been fantastic. First Nike Zoom Airs and then Nike Zoom Vomeros. Everyone’s foot is different so you should always have your feet properly sized and your gait analyzed by running shoe experts before buying new shoes if you can. My feet are narrow with a somewhat normal arch and I prefer a tight fit around the heel and front of the shoe which my Nike Zooms have given me. It will soon be time to buy a new pair of shoes and I will go through the entire process with an open mind. If another shoe seems to be the new perfect fit I will be willing to try it out but I have no problem recommending the Nikes. What’s not to love about Patagonia? Ok, some of their stuff is a little expensive but it’s well made and the company has a fantastic focus on healthy lifestyles and the environment. I have turned to Patagonia for fleece jackets, vests, durable shorts, running shorts, bathing suits, underwear, and everything capilene. Their company and their gear is all about creating, supporting, and encouraging experiences and active lifestyles and that makes me happy every time I flip through a catalog or browse through the website. When you first start running I don’t think you put too much emphasis on your socks. But, over time you realize the importance of a good pair of socks. I actually have two favorites, Balega socks and Under Armour socks and I think I like the Under Armour socks just a hair more because of the way they fit my feet. They are nice and tight but also supportive. They don’t move around my toes while I run like some of my standard cotton socks and they seem to be quite durable through lots of runs and washes. What is your favorite gear? What do you turn to when it’s race day and you need what works and what’s comfortable? I love to hear what other people use and rely on because it opens the window of opportunity to try something new. And when you find someone who shares your love for Under Armour socks or Brooks running shorts, there is almost an instant bond over that reliable gear because the other runner gets it. This entry was posted in Articles and tagged Brooks, Gaiam, Gear, Nike, Patagonia, Under Armour on July 3, 2009 by Natalie.